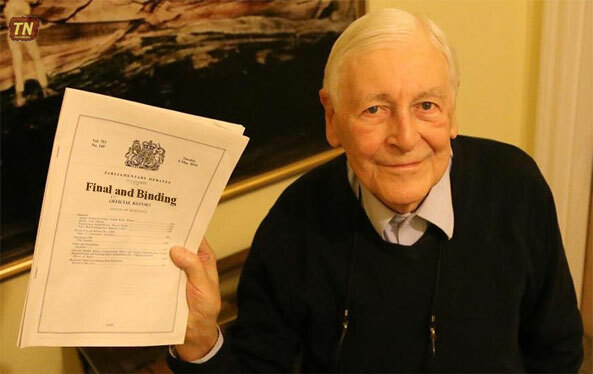 This paper is dedicated to Lord Avebury, liberal Democrat and a Friend of Eritrea. He engaged with the British Government, MPs as well as the Eritrean and Ethiopian Governments on the failure of the Ethiopian Government to comply with the decision of the Eritrean Ethiopian Boundary Commission and the ensuing impact on the people of Eritrea and on peace and stability in the Horn of Africa. During one of my meetings with him, he requested that I provide an overview of the current impasse. Sadly, I was unable to complete this task for him to review before he died peacefully at his London home on the 14th February 2016. This paper is written in his memory and his hope for a resolution to the current impasse. Ethiopia, once a poster child of US foreign policy and development largess, is now fending of allegations of a delinquent state. The “prodigal son” of the US, is now under scrutiny for alleged egregious human rights violations including ethnic cleansing particularly of the Oromo and lowland periphery populations, by the authoritarian and hegemonic policies of the minority, ethnically Tigrayan regime—the Tigray People’s Liberation Front (TPLF). There are credible concerns that the current civil unrest and upheaval in Ethiopia will spill into Eritrea. The US, acutely aware of the impact of war on regional stability, where an implosion in either of these two countries could potentially lead to religious or radical Islamism, will need to revisit its policy towards Eritrea. This is especially the case now as Ethiopia could try and deflect international attention from its internal situation by initiating a substantive attack on Eritrea. Concerns emanate from a number of recent border skirmishes with Eritrea, resulting in significant loss of life. These unprovoked hostilities, in the form of Ethiopian incursions into Eritrea, are continued violations by Ethiopia of the Algiers Peace Agreement signed between the two countries on the 12th December 2000, the Eritrea Ethiopia Boundary Commission (EEBC) ruling issued in 13 April 2002 and the Geneva Conventions. Following official demarcation of the Eritrea-Ethiopia border in November 2007, a bellicose and violent Ethiopian military has maintained ongoing illegal occupation of sovereign Eritrean territory, thus requiring Eritrea to divert its human capital away from the process of nation-building to the protection of its boundary with Ethiopia. The impasse that currently prevails is referred to as the “no war no peace” stalemate. Eritrea’s population stands at 4-6 million while Ethiopia’s stands at 95-100 million. In the face of overwhelming odds, Eritrea has been on a virtual war footing, whereby its national service program, originally scheduled to last only 18 months, has been extended for a prolonged period, as much of Eritrea’s manpower must now remain mobilized and in a state of readiness to thwart off renewed hostilities by Ethiopia along its border with Eritrea spanning 1000 km. Recently in London on Monday 5th September 2016, I attended the APPG Eritrea meeting, chaired by the Hon. MP Matthew Pennycook and Baroness Kinnock at the House of Commons which discussed the economic impact on Eritrea of the national service program. Despite substantive evidence to the contrary, no mention was made of the impact of the simmering tension ensuing from Ethiopia’s continued occupation of sovereign Eritrean territory and incessant saber rattling. Additionally, no mention was made of the failure of members of the international community, including the UN, US, EU and AU, to comply with their obligations as witnesses and guarantors of the Algiers Agreement. Little was said about Ethiopia’s failure to comply with the EEBC decision in April 2002 or importantly the official conclusion of the border decision, given that demarcation was completed in November 2007, presided over by our highly respected senior lawyer and distinguished academic Sir Elli Lauterpacht. The issue has therefore always been the illegal occupation by Ethiopia and not the demarcation of the border. Furthermore, I was dismayed to hear a young gentleman of strong anti-Eritrean Government views refer to the recent border skirmishes as having no substance and insist that, in fact, this was actually an excuse by the Eritrean Government to deliberately enforce indefinite national service. My heart went out to the families of the young men from both Eritrea and Ethiopia who had lost their lives in these recent border skirmishes. I was saddened at how, in a first world democracy, our House was captured by individuals unwilling to engage honestly on facts and were unable to rise above the polarized, simplified debates on Eritrea to appreciate the actual complexity of the situation and therefore genuinely represent the human rights of the long-suffering Eritrean people. Eritrea, initially federated to Ethiopia in 1952 was thereafter annexed in 1962 by Ethiopia with the tacit complicity of the UN. All this was done without regard to the Eritrean people’s aspiration for self-determination. This led the Eritrean people to engage in a 30-year war with Ethiopia – what has been referred to as the “long struggle”. It was only in 1991 that Eritrea achieved independence and was recognized by the UN as an independent country in 1993. That same year, Isaias Afwerki was elected to office with almost unanimous majority as the President of the newly independent Eritrea. It is now 25 years since independence. Sadly, what had intended to be the beginning of peaceful relations between Ethiopia and Eritrea evolved instead into hostilities. In 1998, Eritrea and Ethiopia went to war in what is known as the Boundary War which lasted until the year 2000. A costly war, with substantive loss of lives on both sides, with Ethiopia suffering the heaviest of causalities. To understand the origins and the nature of the conflict, one needs to look back in time to ascertain the intention and modus operandi of the actions and decisions that emanated in the attacks in 1998 and the ensuing border war. One must be aware that around this period, the bilateral ties between Eritrea and Ethiopia were close and cordial and it is therefore difficult to make sense of why the town of Badme in Eritrea, often cited as the casus belli, was relevant. It is only upon review of facts that one is made aware of Ethiopia’s concerted plan to alter the boundaries by laying new facts on the ground, including in Badme and Adi Murug and the unprovoked border skirmishes, as part of a complex, premeditated and centrally planned operation, that included the concerted engagement of external actors. In 1997 two battalions of Ethiopian troops requested permission to enter Eritrea, allegedly in “hot pursuit of an Afar armed opposition group” that had fled into Eritrea. Eritrea acquiesced to the request. The battalions entered Adi Murug in central Eritrea, overstayed their agreed two-week permit and commenced a provocative act of altering the administration of the village, asserting it was Tigrayan land and citing long-standing claims. At the time, President Afwerki, assuming these to be the actions of a few rogue Tigrayan administrators or military units, followed up directly with a handwritten letter to Ethiopian Prime Minister Meles Zenawi. A responding letter by Prime Minister Meles downplayed the provocative act referred to in the initial letter. President Afwerki sent a subsequent letter stressing that “tampering with established boundaries would be a recipe for undesirable and unavoidable tension” with a suggestion that a bilateral Boundary Committee composed of a high-level delegation from both countries be set up to address Ethiopian assertion of land claims along with the suggestion of informed consultation with the local people impacted by the said claims. It is important to note that, despite the fact that colonial boundaries were often thought to be fluid in Africa, the Eritrea Ethiopia boundary was known to be one of the most clearly defined boundaries in Africa. Having been defined by three sequential colonial treaties, that is, the 1900, 1902 and 1908 Treaties, which set out, exhaustively and in detail, the 1000km long border line without any ambiguity. Subsequent State practice for a period of over 100 years did not alter or change that boundary. This was the reality, irrespective of the change in control, that is, from colonization (Italian colonial period after 1908 until 1941), administration (British Military Administration from 1941-1952), and federation (UN imposed federation 1952-1961). The UN expressly re-confirmed the boundaries stipulating in its Resolution 390 A(v) in 1952 that “the territory of Eritrea, including the Islands, is that of the former Italian colony of Eritrea”. In addition, colonial maps confirmed this as Eritrean territory. Ethiopia’s claims were therefore unsubstantiated. Despite this, Eritrea was always willing, and from the outset to engage with Ethiopia to find a peaceful resolution to the asserted claims. The high-level bilateral Boundary Committee was established. However, no substantive action was carried out as Ethiopia maintained during this period that it needed time to compile evidence and facts to establish their claims. The Boundary Committee, therefore, only ever met twice. In the meantime, Ethiopia continued its encroachments on sovereign Eritrean territories by stealth, and in a piecemeal manner. In January 1998, Ethiopian army contingents in Bure (Assab area) penetrated deep into Eritrean territory (some 20km) and tried to set up camp. They were forced to withdraw after firm warnings from Eritrea. This pattern continued in western Eritrea intermittently and in an incremental manner. During the months of March and May 1998, without notice, authority or consultation, Ethiopia commenced the placing of stone pillars in western Eritrea around the area of Badme in undisputed and sovereign Eritrean territory. In one of these provocative breach, the Ethiopian military opened fire on an Eritrean patrol unit that tried to stop the illicit acts, killing five Eritrean soldiers. This incident led to localized skirmishes and the eviction of Ethiopian military units from sovereign Eritrean lands in the Badme area. Ethiopia used this as a pretext to declare war on Eritrea on the 14th May 1998 without disclosing to the international community their action and instigation of the debacle. These actions clearly demonstrate the hidden agenda of Ethiopia’s ruling party to bring under its occupation areas in Eritrea as part of its expansionist plans. Ethiopia had utilized the Boundary Committee discussions as a stalling mechanism by repeatedly postponing its meetings to continue their stealth and sporadic incursions into Eritrean territory. It was a deliberate plan of deception and to thwart all peaceful resolution of the situation. In hindsight, what was required was international scrutiny and investigation of the events of May 1998 and specifically requests were made by President Afwerki to the OAU then – when it would have been clearly evident that it was the Ethiopians that had initiated the war. Once again, Eritrea acted in good faith as evidenced by official statements issued at the time by the Eritrean Cabinet of Ministers and the National Assembly requesting that matters be addressed peacefully and without recourse to war. President Afwerki, on the 24th May 1998, during Eritrean independence day celebrations, emphatically stated “Eritrea does not wish to take an inch of Ethiopia’s sovereign territory; nor will it allow Ethiopia to take an inch of Eritrea’s sovereign territory”. This was part of Eritrea’s continued strategy to try and find a resolve to these actions through bilateral negotiations and discussions and through peaceful means. However Ethiopia was on the offensive and began to expel all Eritreans and Ethiopians of Eritrean origin from Ethiopia. Eritrea’s National Assembly publicly condemned this action and refused to retaliate, instead it resolved to ensure that all rights of Ethiopians in Eritrea would be protected and respected and that any institutions or individuals who took retaliatory action against Ethiopian citizens in Eritrea would be answerable in a court of law. It was at this time that Eritrea sought assistance from the USA and Rwanda. However their intervention further escalated the conflict. The matter was then referred to the OAU with a troika of leaders from Zimbabwe, Burkina Faso and Djibouti who led the first inception of the peace agreement – the Framework Agreement which Ethiopia would later violate in May 1999 to launch a second offensive. All of the peace agreements were drawn up by the OAU and then the USA and the EU with explicit provisions for punitive actions by third parties including the UN Security Council as against the party in breach of the Agreements. However, no action was ever taken against Ethiopia for its continued and blatant breach and violations of the Agreements. There was a pattern emerging in Ethiopia’s conduct. Ethiopia would instigate action, agree to discussions, sign peace agreements to obtain diplomatic traction, whilst utilizing this time to prepare its military to violate the agreements. Ø Moratorium on Air Strikes. o This agreement was brokered by President Clinton on the 7th June 1998 despite Eritrea demands for a Cessation of Hostilities Agreement. The USA suggested that as Ethiopia would not sign such an agreement that the Moratorium would be the first step to a negotiated settlement. o However what Ethiopia actually did was utilise this time to strengthen its air force and on the 6th May 1999 it launched a huge offensive against Eritrea falsely accusing Eritrea for “bombing Adi Grat” in violation of the Moratorium on Air Strikes. o The USA aware that this was a false allegation by Ethiopia refrained from taking any action. o Ethiopia behaved similarly with the Technical Arrangements Agreement, that is Ethiopia utilised the time during the negotiations as a pretext to prepare for and subsequently to launch a third offensive on the 12th May 2000. On the 18th June 2000, the Cessation of Hostilities Agreement was signed. This was only after Ethiopia became aware that despite launching three huge offensives they could not defeat Eritrea, militarily at least. This agreement culminated into the signing of the Algiers Peace Agreement (Algiers Agreement) on the 12th December 2000, also known as the “December Agreement”. Sadly 140,000 souls in total lost their lives because of Ethiopia’s maligned strategies when recourse in good faith should have been sought through Eritrea’s initiative of the Boundary Committee to resolve the dispute and at an early stage. However, what is clear is that there was no good faith on the part of Ethiopia to resolve the claims they asserted despite all evidence to the contrary. It is questionable on an awareness on the part of the international community of Ethiopia’s strategy, why it had failed to take more concerted and effective action as against Ethiopia. The objective of the Algiers Agreement was to bring about lasting peace through expeditious delimitation and demarcation of the boundary between the two countries as established by the prescribed colonial treaties and applicable international law with as much precision as could be achieved. It expressly forbade reference to ex aequo et bono. Ex aequo et bono refers to the settlement of a dispute through arrangements and agreement of the parties notwithstanding the law. This was expressly forbidden. What the EEBC was set to determine was clarification on the fluid nature of the boundaries as it was the custom. ü By Article 4.2 of the Algiers Agreement, the Commission was entrusted with the task of delimiting and demarcating the border between Eritrea and Ethiopia. “the Parties agree that a neutral Boundary Commission composed of five members shall be established with a mandate to delimit and demarcate the colonial treaty border based on pertinent colonial treaties (1900,1902 and 1908) and applicable international law. The Commission shall not have the power to make decisions ex aequo et bono”. ü Article 4.4 of the Algiers Agreement provided for the establishment of a neutral Boundary Commission that shall be located in Hague. “Each party shall, by written notice to the UN Secretary General, appoint two Commissioners within forty five days from the effective date of this Agreement, neither of whom shall be nationals or permanent residents of the party making the appointment. In the event that a party fails to name one or both of its party-appointed Commissioners within the specified time, the Secretary General shall make the appointments”. ü Article 4.5 further stipulated: “The president of the Commission shall be selected by the party-appointed commissioners or, failing their agreement within 30 days of the appointment of the latest party-appointed commissioner, by the Secretary General of the United Nations after consultations with the parties. The president shall be neither a national nor a permanent resident of either party”. ü By Article 4.3 of the Algiers Agreement, the Parties agreed that “the delimitation and demarcation determinations of the Commission shall be final and binding” and further agreed that “each Party shall respect the border so determined, as well as the territorial integrity and sovereignty of the other Party”. ü At Article 4.7 both Eritrea and Ethiopia reaffirmed the principle of respect for the borders existing at independence and that the secretary to the EEBC would be the UN cartographer with the support of the highly experienced UN Cartographic Unit. ü The task of delimitation and demarcation was considered as urgent and was provided in Article 4.12, “..the delimitation should be completed within six months of the first meeting of the Commission. And the requirement under Article 4.13 which called upon the Commission to arrange for “expeditious demarcation”. That is not to leave the boundary un-demarcated for a prolonged period of time or at worse indefinitely. The EEBC delivered its 125-page verdict on the 13th April 2002. Initially, Ethiopia, as widely disseminated through international and domestic press interviews, was entirely satisfied and enthusiastic on the ruling. However, only on a full awareness of the implications and consequences of the decision, that is the loss of the casus belli town of Badme, the place where the hostilities started, did Ethiopia’s controversies on the process begin. Irrespective of which, the EEBC in November 2007 concluded the demarcation phase of the Algiers Agreement. Even until today, Ethiopia has not accepted the decision and remains in violation of the EEBC decision and has not withdrawn its troops from sovereign Eritrean territory. Ethiopia cited many reasons including those having to do with the process, the requirement of more flexibility, practicality and pragmatism, all of which were dismissed by Sir Lauterpacht, the President of the Commission. This was done via a number of communications and correspondences in response to Ethiopia and to the Secretary General of the UN in reference to Ethiopia’s justifications on the requirements of flexibility to the EEBC decision. What is often and deliberately overlooked is that both Eritrea and Ethiopia had agreed that the delimitation and demarcation determinations of the Commission would be “final and binding” and that each would respect the border so determined, as well as the territorial integrity and sovereignty of the other party. The EEBC was required to reaffirm colonial borders, respect colonial treaties for applicable international law to be applied. Further the Agreement provided that Ethiopia and Eritrea were required and committed to “cooperate with the [EEBC] Commission, its experts and other staff in all respects during the process of delimitation and demarcation”. The UN was required to facilitate resolution of humanitarian problems which may arise due to the transfer of territorial control, including the consequences for individuals residing in previously disputed territory. There was no provision in customary international law which would have allowed the possibility of demarcators not so expressly empowered nonetheless to possess such power and the Commission cited three compelling reasons. Ø Third, the Parties knew in advance and agreed that the boundary as delimited by the Commission’s Delimitation Decision would be final and binding as per Article 4.15 and therefore would not be subject to amendment, including therefore the amendment during the process devoted to and limited to demarcation of the boundary – which Ethiopia had consistently maintained should occur. The Algiers Agreement did not provide for parties to make agreements outside the EEBC or to alter or adjust the arbitral award. However, what became evident during the EEBC process was Ethiopia’s intransigence. The process as a result lasted seven years with extensive sessions where Eritrea and Ethiopia submitted more than 40 volumes of memorials and counter memorials and with extensive hearings at the Hague. Ethiopia rejected the EEBC decisions as “unjust, unfair and irresponsible” as referred to in in a letter by Ethiopia’s late Prime Minister, Melles Zenawi to the UN Security Council on the 19th September 2003, calling for an “alternative mechanism”. [Ethiopia’s]….request appears to be founded on a misapprehension…interpretation of the [EEBC] Decision may only be invoked where the meaning of some specific statement in the Decision is unclear and requires clarification in order that the Decision should be properly applied. The concept of interpretation does not open up the possibility of appeal against a decision or the reopening of matters clearly settled by a decision……The Commission does not find…..anything that identifies an uncertainty in the Decision that could be resolved by interpretation at this time….Nor is any case made out for revision…..Accordingly, the Commission concludes that the Ethiopian request is inadmissible and no further action will be taken upon it. disseminating misleading information, request for a more cooperative process to deal with anomalies and practicalities in the demarcation, failure to respond to the Security Council’s call for Ethiopia to fulfil its obligations in respect of the Demarcation Decision, as well as its complaint on the EEBC procedure in its failure to consider the ground realities, that is the prohibition of recourse to ex aequo et bono and Ethiopia’s continued breach of the Algiers Agreement including Ethiopia’s failure to comply with the Commission’s order of 17 July 2002 requiring Ethiopia to arrange for the return to Ethiopian territory of those persons in Dembe Megul, and other requests. All of these misunderstandings and errors were rejected by the President when he referred to Ethiopia’s repeated obstructions to the commission’s field personnel to carry out the demarcation process. In all Ethiopia has consistently maintained that the Commission’s procedure did not conform with international practice and did not allow or provide sufficient consideration of anomalies and impracticability as between the lines set out in the April 2002 Delimitation Decision, and the realities on the ground. Boundaries in Africa were drawn up by colonial powers and the boundaries were not defined by rivers, ravines, mountains etc. Invariably the same ethnic language group is dispersed in neighboring countries. If we look, for instance, at the Afars and Issa’s in Djobouti, the first ethnic group are also found in Eritrea and Ethiopia, while the latter also inhabit Somalia. Oromos in Ethiopia extend to Kenya. Tribes in Ethiopia extend to South Sudan. The Hadareb in Eritrea extend to Eastern Sudan etc. The principle of the sanctity of colonial boundaries is imperative to avoid unleashing interminable wars between neighbors. Ethiopia’s claim to reassert a revision of the boundaries and as it referred to as “human geography” alleging that the boundary demarcation as per the colonial treaties would divide communities and physically divide churches / mosques into separate halves was perceived as nothing more than hyperbole and as cited for the reasons above and that communities could be found on both sides of the border. Further Ethiopia’s claim to a revision in the boundaries would open itself up to claims by Somalia for the Ogaden, from Ethiopia, as well as from the Northern District of Kenya and Issas from Djibouti. Ogaden can otherwise be considered as part of Somalia in historical, linguistic, ethnic and religious terms as it was ceded to Ethiopia by the British under the Treaty of 1948. This is why reliance on the colonial treaties (1900, 1902 and 1948) is considered as imperative to address the border dispute and as stipulated in Articles 4.1 and 4.2 of the Algiers Agreement. Hence the reference in the Algiers Agreement to the Commission shall not have the power to make decisions “ex aequo et bono” to emphasize the above reasoning and principle. Importantly this clause was insisted upon by the international parties that brokered the Algiers Agreement, that is the USA, EU, OAU and the UN. Absent the disputing parties coming to a formal new arrangement between themselves, the EEBC had no authority to vary the boundary line as its mandate was—without any ambiguity—to refer to old colonial treaties under international law without ex aequo et bono decisions. However, Ethiopia’s modus operandi of undermining Eritrea, as evidenced in the offensives launched against Eritrea, precluded the potential of normalizing relations with Eritrea as there was at this stage little or no leverage left for negotiation or potential for agreement by both parties. The Commission consistently maintained that it was not empowered by the Algiers Agreement to vary the delimitation line and was in fact expressly prohibited from doing so. That is the prohibition to ex aequo et bono, which means that the Commission must implement what it finds and further since Ethiopia did not assist in the process, the decision and delimitation had to be by coordinates, instead of the establishment of boundary pillars. The Algiers Agreement provided for expeditious demarcation at Article 14.3 and authority from the Beagle Channel case [52 ILR 284] at the Court of Arbitration provides that where the parties cannot agree the Commission would not be required to “..remain indefinitely in existence in a state of suspended animation”. The Commission therefore proposed that the Parties should, by November 2007, seek to reach agreement on the emplacement of pillars otherwise the Commission would determine the boundary as demarcated by the boundary points and that the Commission would remain in existence and its mandate to demarcate by virtue of the Delimitation Decision of 13 April 2002 as the valid legal description of the boundary. On 27th November 2006, Sir Elihu Lauterpacht provided a statement that Ethiopia was required to recognize the Commissions delimitation and demarcation decision as authoritative and as final and binding; that Eritrea had agreed and to the Commission’s coordinates; and that because the parties did not themselves reach agreement on the boundary, that it would be demarcated by the boundary points and the commissions mandate as fulfilled and followed up on this with a press statement in November 2007. There were indeed spurious objections to the decision by Ethiopia, on the grounds that demarcation by coordinates was not sanctioned by international law; but the parties themselves had agreed to accept the EEBC’s decisions as final and binding and the UN Secretary-General officially reported the EEBC’s decision to the Security Council, which to date has failed to insist on compliance by Ethiopia. What is important to note is that the United Nations Secretary-General and the United Nations Security Council utilized a similar process of demarcation by coordinates in the Iraq-Kuwait border in 1993 and the United Nations Convention on the Law of the Sea addresses disputes and maritime claims by States in this manner. Eritrea has pressed the UN security council who has the power to exercise its legal authority of enforcing the delimitation and demarcation determinations of the EEBC, however to no avail. Eritrea’s respect of international law was evidenced in 1998 when Eritrea accepted and complied, even to its detriment, the arbitration decision that rejected its claim to the Hanish archipelago and favored Yemen. Ethiopia has never been brought to task by the guarantors or the international community to address its breaches and violations of the Peace Agreements and the EEBC decision. Interestingly, much of the academic papers published level criticism at the EEBC which includes its lack of flexibility to the assertion that the correct forum should have been that of conflict settlement to address what some authors consider to be the otherwise application of anachronistic and illegal colonial treaties. Further there has been suggestions of the application of the principle of equity which Lord Denning’s advocated in the Trendtex Trading Corp v Central Bank of Nigeria case  Q.B 529, which was highly irregular as there was an express provision of no reference to ex aequo et bono unless there was express agreement by the two sovereign states. Lord Avebury has repeatedly engaged with Ethiopia to lobby for a resolve to the border dispute with Eritrea, by abiding with the Algiers Agreement and accepting the Border Commission’s findings. Ethiopians continue to unlawfully occupy sovereign Eritrean territory all along the border that should have been demilitarized under the settlement, requiring Eritrea to maintain large armed forces and through its national service as a precaution against further military attacks by Ethiopia. Lord Avebury has gone in so far as to say that pressure should be brought to Ethiopia and potentially through the UN Security Council to accept the EEBC decision and that the British Government should table a resolution to that effect; that regarding the recent border skirmishes, reference should be made by both parties to the Cessation of Hostilities Agreement, where the OAU and UN had undertaken to guarantee the respect and compliance of that commitment according to the agreement, which included appropriate enforcement measures under Chapter VII of the UN Charter such as economic sanctions and potentially military actions. No such action has been taken by the guarantors or the UN as to seek compliance by Ethiopia. The international community and the guarantors to the Algiers Agreement have failed to honor their obligations as guarantors to the Algiers Agreement by ensuring that Ethiopia respect the delineation and demarcation decision of the EEBC and comply with the Algiers Agreement. There have been representations from the EEBC and UN Security Council resolutions including by the President of the Security Council in 2006 requiring the need for Ethiopia to comply. However, the UN Security Council under pressure from the USA did not invoke Article 14 of the Cessation of Hostilities Agreement and the UN Charter to compel Ethiopia to comply with the provisions of the Peace Agreements or provide for punitive measures against Ethiopia. In light of the current upheavals being experienced in Ethiopia, there is concern of fresh hostilities from a bellicose Ethiopia directed at Eritrea. This is evidenced by Ethiopia’s Premier Hailemariam Desalegn’s recent address to the Ethiopian parliament in July 2015 alleging a destabilization campaign by Eritrea, which Eritrea denies, and further threatening to take action against Eritrea, is of particular concern. Particularly because Ethiopia acted on these accusations and attacked Eritrea in June 2016. In light of the asymmetry of international relations towards Eritrea and Ethiopia, the impact of sanctions via UN Resolutions 1907 and 2023, the impact of national service in response to continued threats and saber rattling by Ethiopia – the people of Eritrea, a country in the throes of nation building, are left to pay a heavy price. The International Community has a legal and moral responsibility to ensure that there is no further bloodshed or skirmishes or a full-blown border war by taking action and (i) tabling a UN Security Council resolution and decision that provides for Ethiopia’s compliance with the Peace Agreements and the decision of the EEBC; and (ii) to further assist in facilitating regional peace in the Horn of Africa to pave the way for greater cooperation amongst Eritrea and Ethiopia and in other areas such as poverty eradication, public health, development, and anti-terrorism. The writer is founder and principal consultant at RS Collaboration. She is also a Lawyer, Facilitator and Mediator. Eritrea-Ethiopia Boundary Commission. Decision regarding the “request for Interpretation, Correction and Consultation” submitted by the Federal Democratic Republic of Ethiopia on 13 May 2002. What a wonderful recap of the Algiers Peace Agreement. Ethiopia’s refusal to comply with the firm and final ruling of the Boundary Commission is the primary source of instability in the entire horn-Africa. Thank you Ms. Sandhu. I am sure the late Lord Bravery would be pleased with this great report. As for the anti-Eritrea paid agents, Eritrea too has a special place for its cowards. Colonial boundaries are often thought to be fluid, the article reads and with the same breath, colonial maps confirmed its Eritrean land. There is one problem, the new Ethiopia cannot accept the treaties of the 1900’s. It was down right offensive. If peace would to come before us towrds Asmera, accepting the five points Meles outlined would be a start. The peace loving Eritreans should be asking quesions like, if Ethiopia would leave badme, does Wedi Afom intend to do away with NS? Or not support shabba? Or not support Ethiopia’s bad actors? The clear answer is hell no. For those reaons, why we would work with someone who is hell bent on destroying Ethiopia? At the rate its going, its either us or him, stay tuned. You are simply a filthy human scam! Keep blabbering. Reality is about to catch up with you soon. Never mind form Eritrea land ,you are going to vacate from inter Ethiopia land very sooon watch out and wait .I don’t know where you will be , like John in England ,The TPLF regime you will be homeless on street with the no land.NO Ethiopia No land in the while world,you will be exile. Just mind your own business!!! traitor, kedami nay kedmi kedami. Eritrea will keep moving in silence and only speaks when it’s time to say, CHECKMATE woyane. Yes, stay tuned. We Eritreans by nature are not Egyptians to whom you convince to build the dam, ayte senteqo, we know each other through history, we’ll see who is going to tell the final..yeraqebenna..ajoqa, ab endamatka meriet deqis kas yewah deqas ketdeqes leyheseb..
Oh u poor ዕባራ Sentiqo, ur not just going out of Eritrean land Badme, also from Amhara land==>> welqaite etc, and soon ur going to lose the whole Ethiopia. The 1st wave is already at work.. the rebellion of Ethio-ppl. ???? 2nd wave is already done…Agame getting deported from Ethio..u can’t even move to other parts of Ethiopia without looking behind ur back and u will always going to be hunted-down, and yes.. business owned by Tigrayans burned to the ground etc. Now Ugumesh are the most hated creatures in Ethiopia and that is job well done. Wouldn’t u agree?? And the 3rd is going to be… sandwiching ur beloved Woyane-Tigray in every corner by==>> Gambella People’s Liberation Movement (GPLM), Benishangul Peoples Liberation Movement (BPLM), Amhara Democratic Force Movement (ADFM) and Arbegnoch Ginbot 7 for Unity and Democratic Movement (AGUDM) etc.. Yes this were ur former cannon fodders.. but not anymore, cuz now they are fighting for their ppl freedom, equality and dignity. And we will see how far will Tigray go without them. This time ur going to pay dearly Ugumesh. ???? cuz u ppl only become peaceful and religious when a kalashnikov is pointed at ur face. ???????? But like always keep on denying, and keep killing. Like they say.. “Never interrupt your enemy when he is making a mistake.” ???????? One gets disappointed and furious with one dishonest indian (Sheila Keetaruth) and then comes a total opposite- Ruby Sandhu. Woyane will vacate the entire Horn of Africa not just Eritrean territory. The West is done using Woyane as its condom. As always, u stupid shabia cadres, still after killing tens thousands of Ethiopian men and women in war for stupid barren land, wont admit the war was not about some boundary issue. Instead, that lunatic leaders of yours wants be to boss and got what he deserve at last. The lunatic had been preparing for the war, that’s why he dig all that trenches months before the war, but at the end it became grave yard for his own men. After the war, badme is not just barren land any more, but it is symbol of patriotism where ten thousands of Ethiopian innocent men paid to defend their country. Idiot shabia scumbag. you always refer..colonials…. as a rule and solution please be your self rely on your means…allegations couldn’t be solutions..and be wise.. pfdj.. is a real mafia here….and sorry Ethiopians would annex Eritrea within a night if woyane let the ethiopians to do so! !